This 7-day small group tour takes you along some of Norway’s most magnificent fjords, with the convenience and knowledge of a local guide. Starting in Bergen, you will spend the night in charming villages in premium accommodations, navigate the twisty Gaularfjellet road, and explore the UNESCO-protected Geirangerfjord where you see famous waterfalls like the Seven Sisters, the Suitor, and the Bridal Veil. Other attractions include the breathtaking viewpoints from Dalsnibba and Flydalsjuvet, the Flåmsbana railway and the Sognefjellet national tourist route. After arriving at Bergen - Flesland Airport, make your way to the charming Bergen city centre, where your hotel for the night is located. For those arriving early, we recommend spending the afternoon strolling the city and discovering the lovely sights of scenic Bergen. 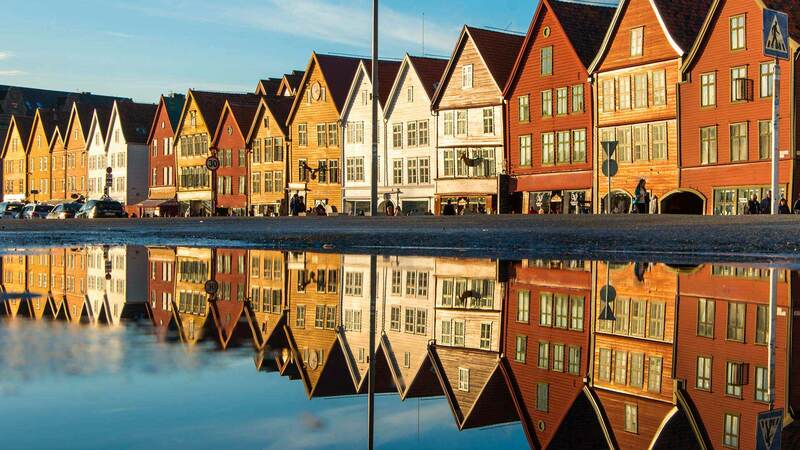 City highlights include the old wharf of Bryggen—a UNESCO World Heritage site, centuries-old houses, a vibrant fish and flower market and an interesting range of museums. For a good overview of Bergen, we recommend taking the “Floibanen” Funicular up the mountainside, which reveals spectacular views. At 18:00, the group will meet for a welcome drink with the tour guide. This is the perfect opportunity to get acquainted with your fellow travel companions for the next 5 days. Tonight, you dine on your own in Bergen. 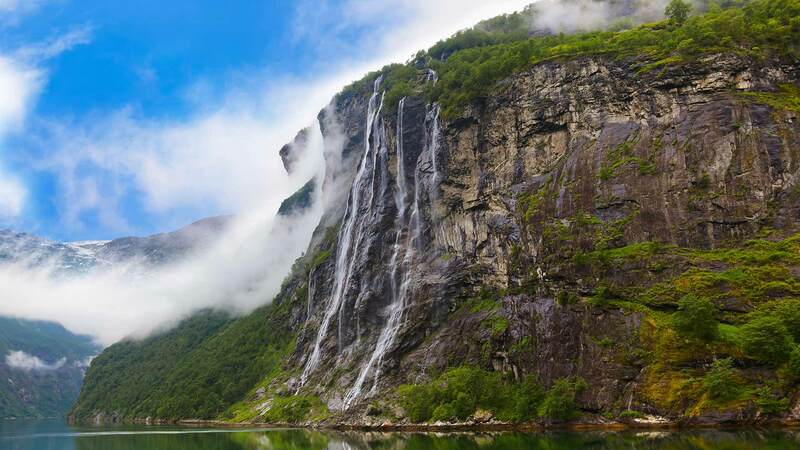 This morning the guide will meet you at the hotel and we will start the first leg of the trip by heading to Norway’s adventure capital, Voss and the beautiful Tvindefossen waterfall. 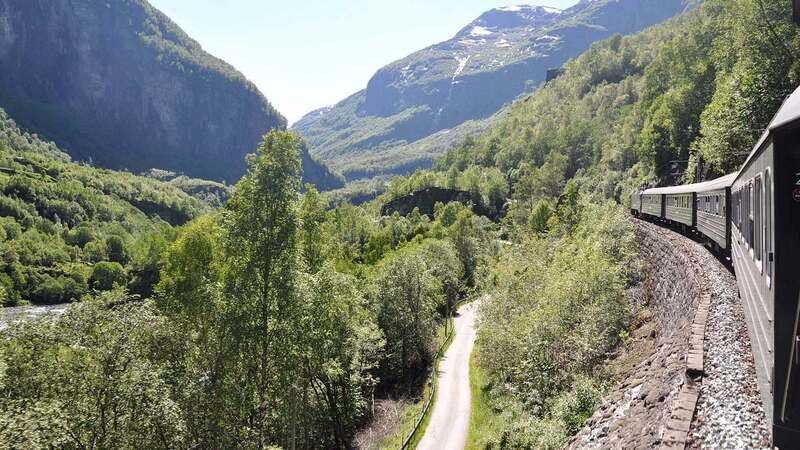 Your journey will then continue to Sogndal along the Sognefjord—Norway’s longest and deepest fjord—taking in sights including the towns of Stalheim, before continuing to the beautiful Aurlandsfjord, where we will make a 3-hour stop. Here, you will experience the famous Flåm Railway, or Flåmsbana, a steep train ride between Flåm and Myrdal—a treat for photographers or train enthusiasts alike! 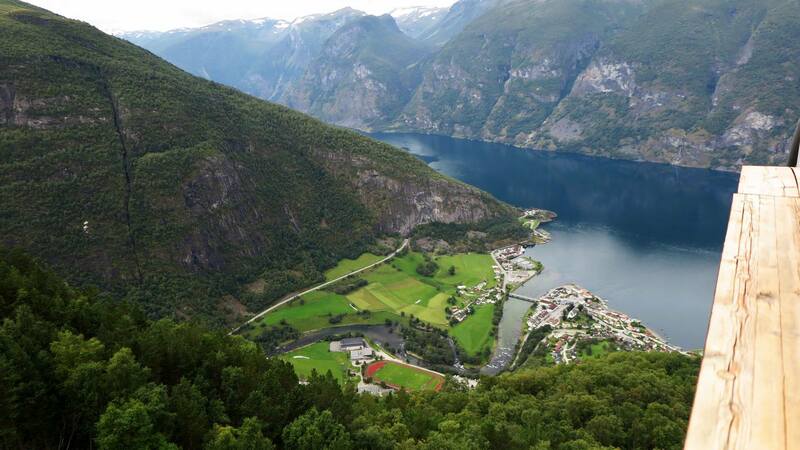 After a scenic drive, the tour will make a stop at Stegastein, where you can enjoy a panoramic view of Aurlandsfjord. End the day with local and fresh dinner at the exclusive and unique Bestebakken in Hafslo. Spend the night at Bestebakken or similar. This morning we will visit Urnes, one of the oldest stave churches in Norway, which is included on UNESCO’s World Heritage list. To reach the church we will board a ferry from the charming village of Svolvorn before making our way north along Lustrafjorden to the famous National Tourist Route “Sognefjellsvegen”. This route is the highest and most impressive mountain pass in Northern Europe. The landscape reveals vast, towering mountains as it passes through the Jotunheimen national park. 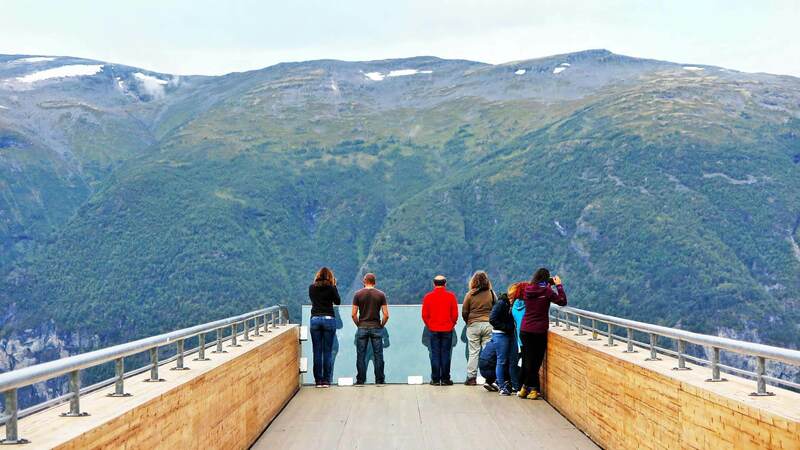 From Lom, the tour heads to the Dalsnibba skywalk, which is Europe’s highest fjord viewpoint by road. 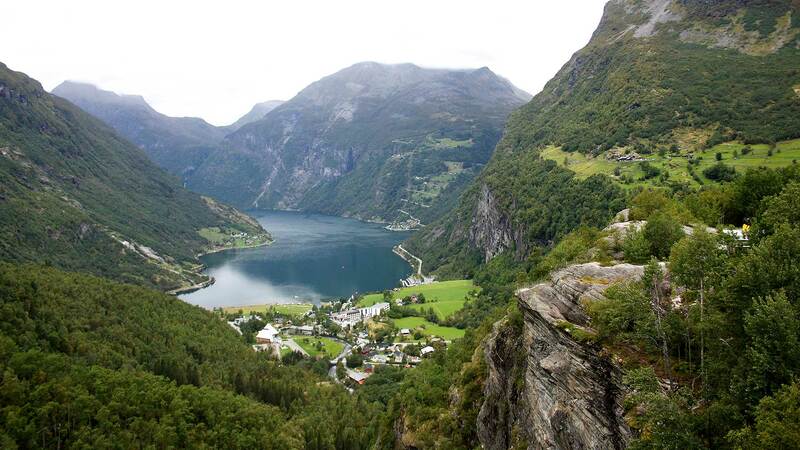 There you will enjoy sweeping views of Geiranger, as well as across to the mountains and the mighty Blåbreen glacier. Our journey then continues to the Geiranger village where you will enjoy dinner with the group. Spend the night at Hotel Union or similar. After breakfast you can spend the morning on your own, exploring Geiranger until noon. 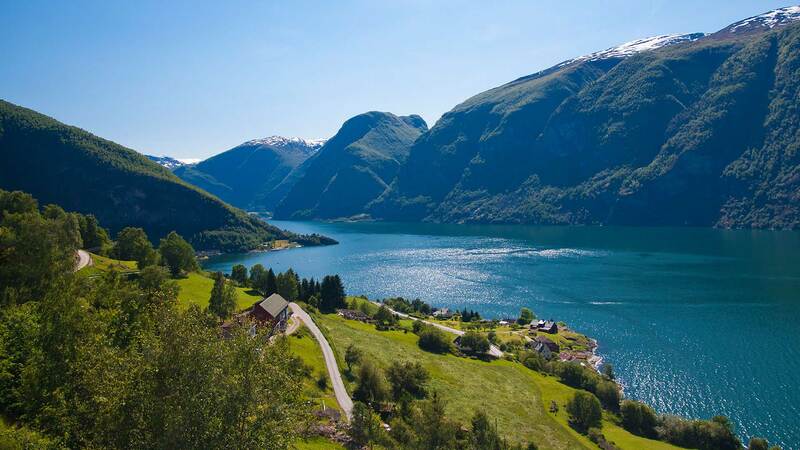 With its fairytale landscape, Geiranger has a lot to offer for nature lovers like snow-covered mountain tops wild waterfalls, lush green vegetation and the deep blue fjord. You can go hiking, kayaking, go on a rib boat safari, relax at the nearby spa or visit the chocolate factory in town. 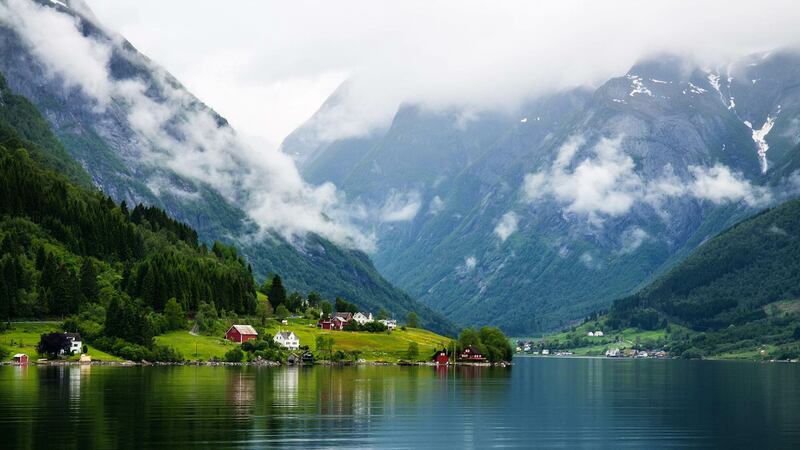 After lunch, we will start our journey to Loen with a 90-minute ferry through the UNESCO-protected Geirangerfjord where you see famous waterfalls like the Seven Sisters, the Suitor, and the Bridal Veil, along with abandoned fjord farms in the mountains. The sightseeing ferry ends in the small village of Hellesylt where we start the drive south towards Loen. Upon arrival in Loen the group will enjoy dinner at Hotel Alexandra. Spend the night at Hotel Alexandra or similar. 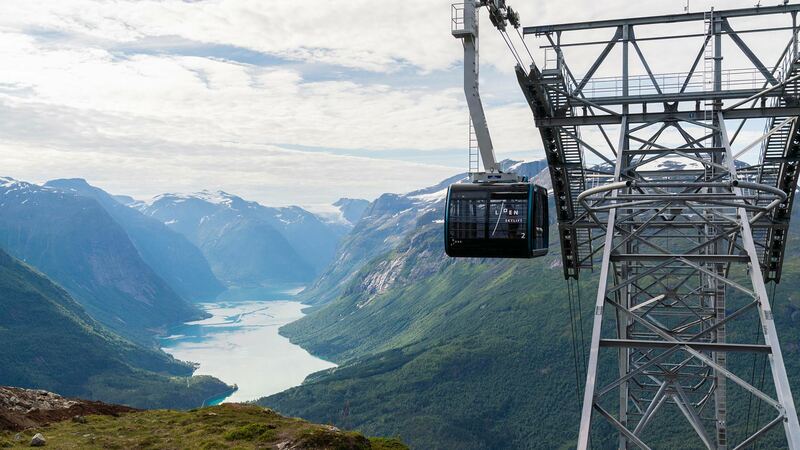 We will start the morning by boarding the magnificent Loen Skylift, a cable car that will transport us to the altitude of 1011 meters with amazing views of the fjord. Later, the tour will continue south towards Byrkjelo village where we will make a short stop for a rest. The drive will continue south along the scenic lakes Jölstravanet and Hakedalsvatnet, before travelling the scenic route of Gaularfjellet where the road twists and turns through nine hairpin bends, revealing jaw-dropping scenery. We will make a short stop at Utsikten where you can admire the panoramic views of towering mountains and lush valleys. 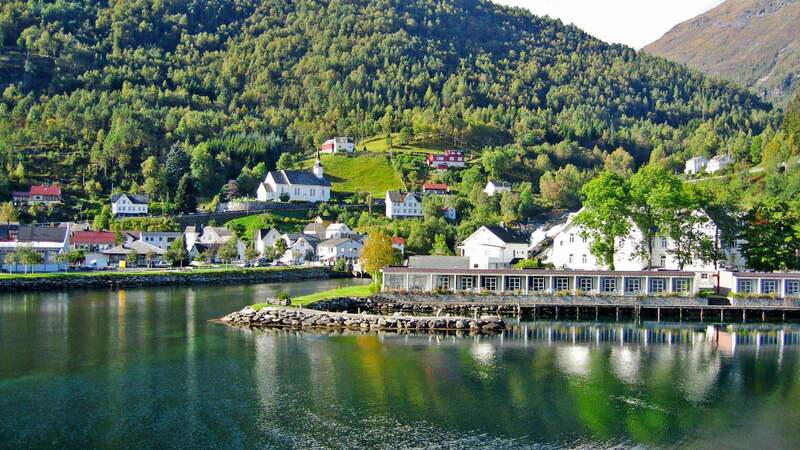 Next, our journey continues to the historical hotel at Balestrand where you will enjoy the last group dinner. Spend the night at Kviknes Hotel or similar. Driving distance approx. 190 km / 118 mi. Start today with a visit to the Cider House, a family-run organic orchard and cider producer, located in the village of Balestrand. Here you can sample some cider and non-alcoholic beverages and have a tour of the farm. After our visit to the Cider House, we will head back to Bergen, with a short ferry crossing from Balestrand to Vagnes. We will pass Vik village where you find Hove Church, the oldest stone building in the Sogn region. You will be driven over Vik mountain to Myrkdalen, the centre of agriculture for the region, where there lies a beautiful cultivated landscape. We will then return to Voss and continue back to Bergen, where you will spend the evening. Driving distance approx. 195 km / 121 mi. When it‘s time for your Norwegian adventure to come to an end, you can either take the airport bus from one of the many departure points in the Bergen city centre or you can take a taxi directly from your hotel to Bergen-Flesland Airport. If your flight is in the afternoon, you can choose to enjoy some last-minute shopping, visit one of Bergen‘s many museums or relax at a café, enjoying the last few moments of this amazing journey. Rooms with private WC and shower (or bath) in a four-star hotel or the best accommodation available in the area at the time of booking. All provide breakfast (included in the price). We recommend that all Nordic Visitor travellers read through the following information about what the tour includes, deposit payments, what to pack for your holiday, and useful information about the activities included on the tour. 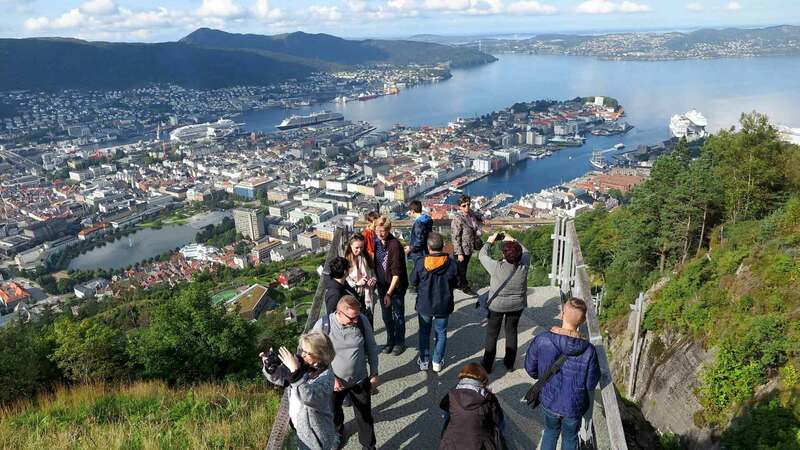 If you wish to spend more time in Bergen or add Oslo to your trip, before or after the guided tour, ask your travel consultant about adding extra nights or services, such as transfers by train between the two cities, private airport transfers or guided tours. For an even better Nordic travel experience, we could extend your trip with visits to Iceland, Scotland and/or Greenland. Please contact us for information about customising your itinerary! Our team of local expert guides at Nordic Visitor are highly recommended by our travellers and staff with years of experience. What they offer is local knowledge, love for their country, their stories, favourite places and sites where travellers, on their own, would not hear about or visit. They always have some trick up their sleeves and hidden gems to surprise our clients and therefore we recommend that you join our guided small group tours to get a personal experience for your Norwegian adventure. There will be one guide per tour. As an expert on Norway, the guide is also a valuable resource for questions about local customs, languages, shopping, food and other practical travel information. To ensure comfortable seating for everyone on our tour, we need to limit the size and amount of luggage. We request that you leave non-essential luggage at the hotel in Bergen and to only keep with you, daily essentials like camera, wallet, medications and so forth.Please contact your Nordic Visitor travel consultant if you have any questions about luggage. To ensure comfortable seating for everyone on our tour, we need to limit the size and amount of luggage on the van. Each guest is allowed one suitcase or large bag that can be stored in the back of the van and one smaller item (e.g., a small backpack or daypack) to keep inside the van for daily essentials like camera, wallet, medications and so forth. We request that you store your non-essential luggage for the tour at the hotel in Bergen. Unfortunately carry-on suitcases (cabin bags) are too large to store inside the van in the overhead racks. If you have any questions about luggage your Nordic Visitor travel consultant will be able to assist you. This tour is suitable for most travellers in fair to average physical condition. Participants must be able to comfortably walk on uneven and unpaved paths and walkways. Your guide will always see if there is an easier alternative if conditions require it and offer a slower pace, with breaks, when needed. If you have any doubts, please feel free to contact me with any questions or concerns. Note that luggage service is not included. A daily breakfast buffet is included at your booked hotels and cruises for the duration of your stay. You will also enjoy four dinners with the group, included in your package. They will include either a set 2-3 course dinner menu or a dinner buffet with a good variety of local fresh ingredients. Please notify your travel consultant in advance of any dietary restrictions. Other meals and drinks are not included during the trip.